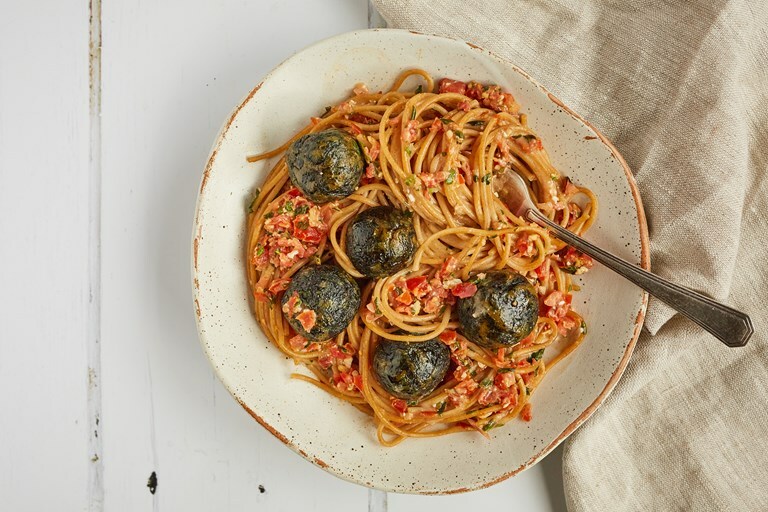 This vegetarian pasta recipe from Anna Jones makes the most of the short wild garlic season, adding the leaves to 'meatballs' made with puy lentils. When combined with spaghetti and a tomato and wild garlic pesto, this is a dish that deliciously ushers in the first signs of spring. Anna Jones is a cook, writer and stylist, the voice of modern vegetarian cooking and the author of the bestselling A Modern Way to Eat, A Modern Way to Cook and The Modern Cook’s Year.